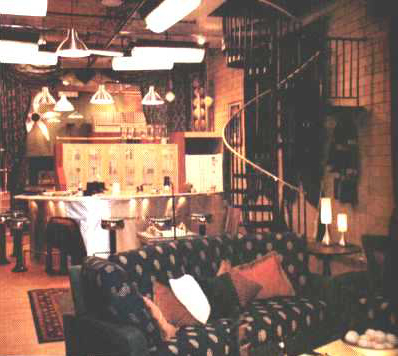 The Kitchen in the Boston Firehouse during the filming of the series. This picture was taken from the Living Room looking north towards the Kitchen and Billiard Room. The Billiard Room was located on an elevated platform behind the Kitchen. The Spiral Staircase led upstairs to the Lounge and Office. The fish tank was actually seven individual cylinders located above the Kitchen cabinets. The view from behind the Kitchen counter looking south towards the Living Room. The Phone Room was located next to the Living Room through the doorway in the southwest corner of the building.